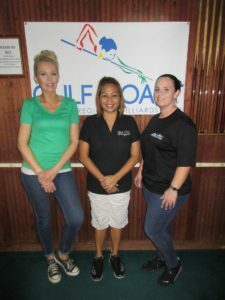 Ming Ng went undefeated through an elite field of 34 players, defeating Courtney Peters in the finals, to win her third event of the 2018 Gulf Coast Women’s Regional Billiards Tour season. Annual award recipients were also recognized at this event. 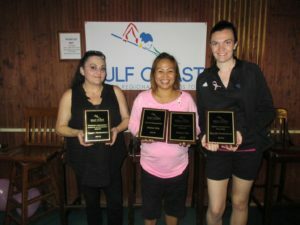 Topping the Gulf Coast rankings, Ming Ng earned “Tour Champion” for her exemplary play, and Ellen Robinson was awarded “Most Improved Player” for the most significant jump in the rankings. Voted on by Gulf Coast Tour members, Terry Petrosino took home the “Rebecca Arcangeli Dubious Achievement Award”, and Ming was honored with the “Sportsmanship Award”. Congratulations to a well-deserving group of women. “We would like to thank our 91 player-members who ensured the success of this Tour in 2018, and all the players who have stuck with us since our 2013 inception. It’s hard to believe that we will celebrate seven years in 2019! We’ve scheduled our first event for January 5th-6th, 2019, at a new host location in Houston, Texas. 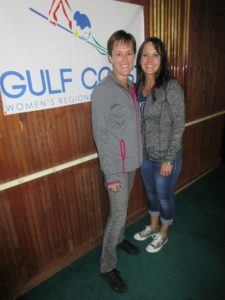 In the coming weeks, our Tour will be publishing the new schedule, and we have some big surprises in store for our players,” says Kim Newsome, WPBA Exempt Professional and founder of the Gulf Coast Tour. For press releases, schedule, rankings, and more, stay tuned to www. GulfCoastWomensTour.com. 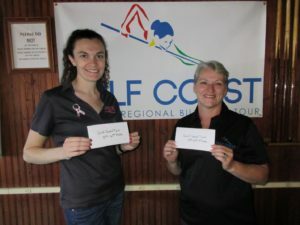 On October 13th-14th, 2018, sponsors Cyclop Pool Balls, APA of North Harris County, Vapor Knights USA, Outsville Billiards, philanthropist, Chuck Adams, and Southern Streaming, facilitated another successful event for the Gulf Coast Women’s Regional Billiards Tour, paying out $1,780 in prize money, for the two-day, $1,000 added women’s 9-ball event. In addition to being the final event of the year, this was the Tour’s first, Breast Cancer Awareness Event, benefitting breast cancer survivor and Tour player, Toni Esteves, and the National Breast Cancer Awareness Foundation. Nearly $1,000 was raised to support the cause! Following a brief players’ meeting, matches were called and play commenced. Ming Ng made her way to the winners’ side final four, booking wins over San Antonio’s Ruth Paine, Robyn Petrosino, 7-1, and K.C. Mink, 7-2, while newcomer Terri Urban tagged Sandra Melo, 6-4, Austin’s Maria Requejo, 7-0, and Terry Petrosino. Austin’s Stacie Putnam defeated Teresa “Princess of Pool” Garland, 7-3, new player, Misty Lancina, 7-2, and Courtney Peters, 7-6, while BCA Champ, Yvonne Asher, overcame newbie Michaela Parmer, 7-2, Toni Esteves, 7-5, and young gun Aryana Lynch, 7-3. Down to the final sixteen, on the one loss side, Requejo took out Parmer, 5-4, but fell to Peters, 5-1, while R. Petrosino slid by Garland, 5-4, and eliminated Lynch, 5-2. Loretta Lindgren defeated Melo, 5-4, and Mink, 5-4, while Ellen Robinson dusted off Lancina, 5-0, and T. Petrosino. Back on the east side, Ng overwhelmed Urban, 7-1, and Asher overpowered Putnam, 7-1. In the hot seat match, Ng took charge, sending Asher to the west side, 7-2. Back on the one loss side, in the final eight and in the money, Peters eliminated R. Petrosino and Urban, by the same score, 5-2. Robinson shut out Lindgren, 5-0, but succumbed to Putnam, 5-3. Peters barreled through Putnam, 5-1, and made Asher her fifth victim, 5-4. Peters earned herself a shot at Ng, and her second title of the year. In the first set of the true, double elimination final, Ng would not be denied. She defeated Peters, 7-3, to win her third title of the 2018 Gulf Coast Tour season. Congratulations to Teresa Garland who captured the second chance event, and Loretta Lindgren, who finished runner-up. 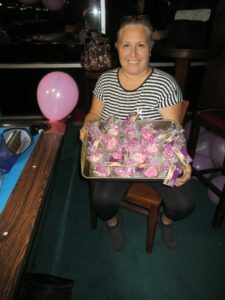 The Tour would like to express its deepest gratitude to each and every person who contributed silent auction items, baked goods, and monetary donations, to make this breast cancer awareness event, a success! Special thanks to Julia Acevedo, who not only baked some delicious treats, but donated her time to collect all the money from the baked goods sale. Silent auction items were donated by: Grady Cooper, Shar Dyer, Toni Esteves, Ellen Robinson, Terri Resendez, Monica DeTuncq, and D’Andrea McQuirter. Sissy Lozano made the beautiful breast cancer ribbons and baskets, and D’Andrea also brought pink balloons, and provided massages for the players. The Tour is deeply appreciative of its Tour Team Members, who kept the entire event, and programs, running smoothly: Gail Roles, Calaia Jackson, Ruth Paine, Ming Ng, Toni Esteves, and D’Andrea McQuirter. Congratulations to Adam “Coop” Cooper, who won the Cyclop Pool Ball “Zeus” Set in the Gulf Coast Tour Raffle. Funds from the raffle were allocated as part of the added money in the ladies’ event. The Tour would like to welcome its newest members: Terri Urban, Marissa LaCoste, Nicole Sanchez, Michaela Parmer, Misty Lancina, and Sherry Hildebrand. Players’ dues paid at this event will be good through 2019. If you are interested in joining the Gulf Coast Women’s Regional Billiards Tour, please contact Kim Newsome at 713-825-1411, or email lonestartour@gmail.com.